Bouquets 11-20, filmed in Italy, Switzerland and France, was delayed by the weather and a series of related technical/aesthetics incidents. 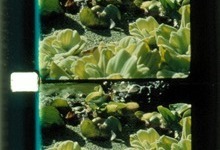 The ten little films (1 minute or 1440 frames each, with the exception of 23 frames or nearly a second more for n°16), continues the work begun with the series Bouquets 1-10 and 21-30. This consists of weaving in camera visual aspects of the filmed reality in order to bring into existence specific features of the cinematographic image, hopefully placing us on a boundary outside the traditional rôles of description or abstraction. 10 Bouquets, each one minute long, all filmed at ecological sites.